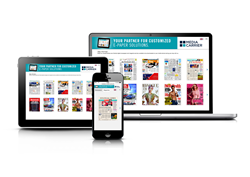 Venues with wi-Q or Mi-Room can now further enhance the customer or guest experience through a customisable portfolio of international and national newspapers and magazines, available to download instantly. Available titles include The Times, Wall Street Journal, Top Gear, Elle, Men’s Health and Vogue. wi-Q Technologies is the award-winning, British hospitality technology company behind web-based mobile ordering solutions, wi-Q and Mi-Room. wi-Q Technologies help hospitality businesses avoid the development costs of a custom native mobile ordering app by providing a web-based, fully brand-customisable and scalable alternative. With the technology in place, customers can instantly browse, order and pay for a venue’s products and services, all through the Internet browser on their own mobile device. This could allow a customer to order a coffee en-route to a meeting, order more popcorn from their cinema seat, cocktails to their sun lounger or more pillows to their hotel room – without downloading a mobile app. With full support for common hospitality systems such as Oracle Hospitality and world-leading payment providers such as PayPal, wi-Q Technologies offer a truly seamless and instant ordering experience. Like wi-Q and Mi-Room, Media Box is a web-based service and can be accessed via any Internet-enabled device. The customer does not have to install an app or register personal data. The desired publications can be downloaded with a click, in PDF format. Individual articles can even be magnified, and the pages scrolled or swiped. wi-Q Technologies provide the world-leading integrated HTML software solution, revolutionising the hospitality industry by placing the menu and ordering capability in the customers’ hands. Accessed via Wi-Fi or any mobile connection, rather than being a device restrictive app, wi-Q and Mi-Room can be accessed using any mobile enabled device. The customer can select from the easy to update menu, place their order, make further purchases (think dessert or second cup of coffee), request a bill or pay for their order, all from the comfort of their seat, using their chosen device and without having to queue. Venues with wi-Q have reported uplifts in revenue averaging 15% within a month of implementing wi-Q and installations are taking place across the world in a diverse range of sectors from coffee shops to hotels. Media Carrier GmbH was established in 2011 as a subsidiary of the Munich-based MELO Group, whose central divisions are built on the two pillars media and logistics. The company specialises in marketing and distributing digital content. Through its digital media library Media Box, it supplies the travel industry with e-papers and more than 1000 hotels worldwide use the digital media library. The Lufthansa Group (Lufthansa, Austrian Airlines, SWISS, Eurowings and Air Dolomiti) as well as Oman Air and Virgin Atlantic are among the airlines offering the Media Box service to their guests.